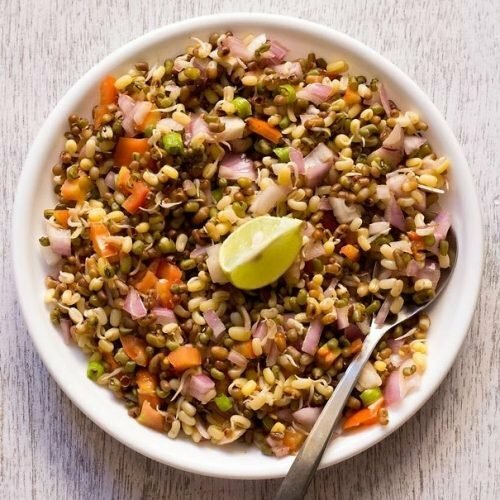 moong sprouts salad recipe - easy, tasty and healthy salad recipe of moong beans sprout. once the moong sprouts are ready, rinse them in water. then either steam it or boil them till the sprouts are completely cooked. you can even keep it half cooked if you want a crunchy taste. then strain the cooked sprouts. take 2 cups of steamed or boiled moong sprouts in a big bowl or vessel. add 1 small sized finely chopped onion and 1 medium sized finely chopped tomato. next add 1 finely chopped green chili (hari mirch). also add 1 boiled potato (optional). then add ¼ teaspoon red chili powder (lal mirch powder) and ½ or 1 teaspoon chaat masala (optional). stir very well. lastly, season with salt and pour 1 teaspoon lemon juice or as required. mix well. garnish moong sprouts salad with coriander leaves and lemon slices..